On the morning of 24 August, in the year 79 AD, a sudden tremor abruptly interrupted the daily routine of the inhabitants of Pompeii. The tremor was followed shortly by a tremendous blast signaling the beginning of a violent eruption of nearby Mount Vesuvius. 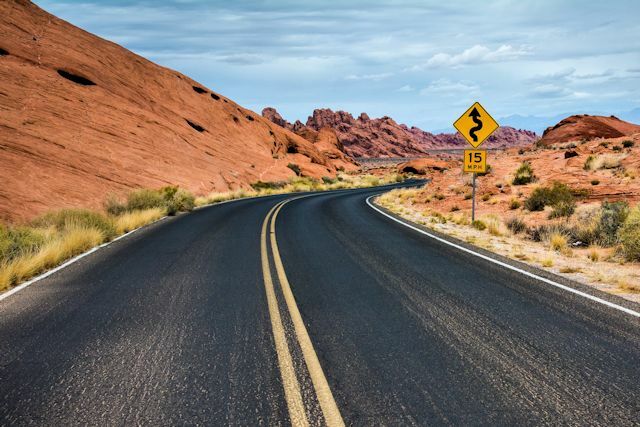 A column of rock particles rose more than 65,000 feet into the sky. Carried by the wind, this cloud of rock hailed down upon Pompeii, submerging the city in just a few hours in some 10 feet of material. Roofs of many houses caved in under the weight. But the worst was yet to come. 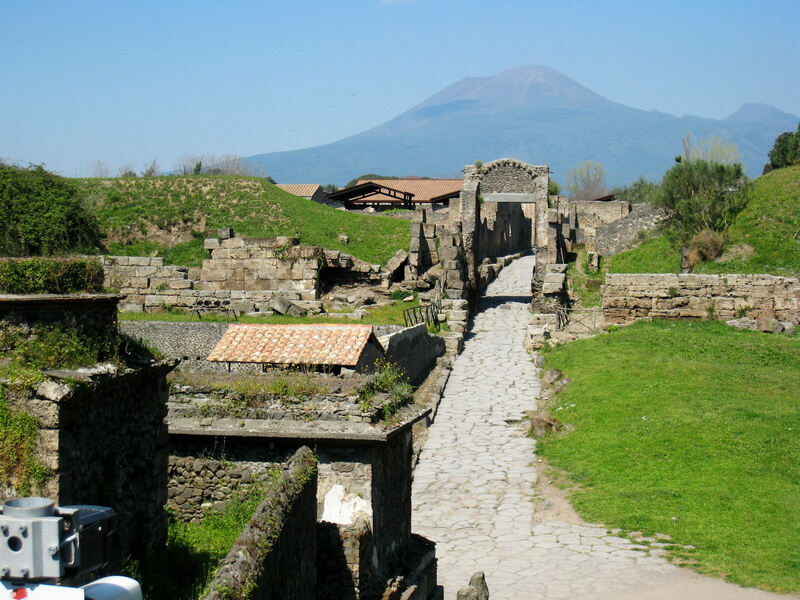 At dawn on the following day, the first volcanic flow, composed of hot gases and fine ash, hit Pompeii and sealed the fate of every person and animal it encountered. Though it was once thought that the burning ash clogged the lungs and suffocated the victims, recent studies suggest that the heat alone was probably the main cause of death. Since the town was less than five miles from the volcano, the intense heat surges from the volcano's vent, estimated at greater than 500° F, would have caused instant death, even if people were sheltered inside buildings. Shortly thereafter, with no living being was left in the town, a second flow, much more powerful than the first, fell with fury upon the walls of the town, toppling or sweeping away their upper portions. It has been calculated that this volcanic flow was probably traveling more than 50 miles per hour as it engulfed and carried away objects, roofing tiles, and even the bodies of the dead citizens. Other surges hit Pompeii in waves after the city had already been destroyed. In the end, Pompeii was buried under more than 80 feet of ash and rock matter in a desolate gray landscape whose only features were a few protruding walls. On the other side of Mount Vesuvius, the town of Herculaneum suffered a similar fate. 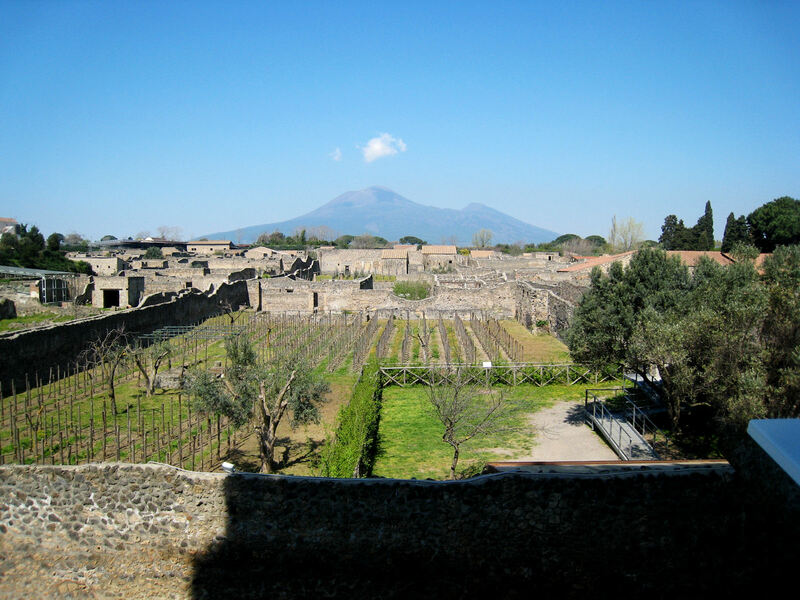 Although the initial phases of volcanic ash and gas were blown to the southeast toward Pompeii, Herculaneum eventually was covered when the eruptive cloud collapsed. 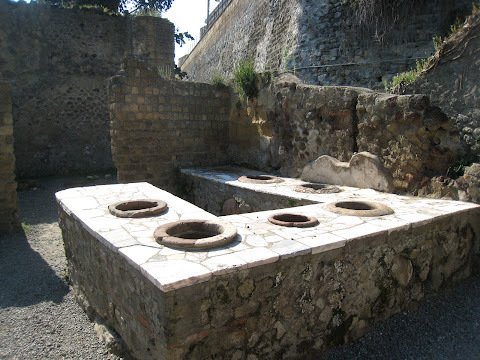 Because it avoided the intensity of the surges that hit Pompeii, many buildings in Herculaneum were preserved almost intact, as they were filled and covered from the ground up with 60 feet of mud and ash. 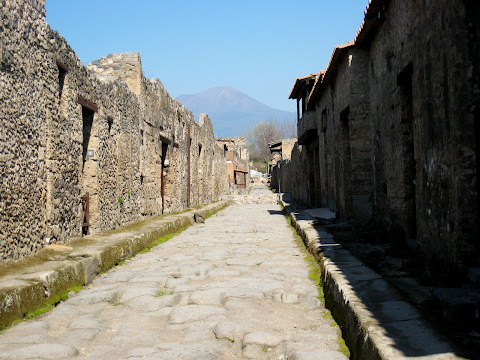 At the time of the eruption, Pompeii was a city of perhaps 20,000 people. 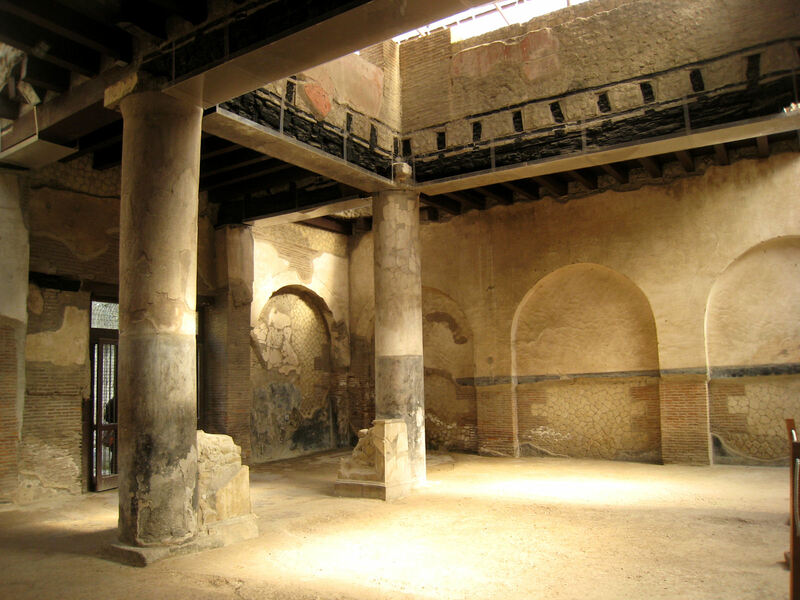 The city was located in an area where many Romans had their vacation homes, and it was a popular destination for Romans on holiday. 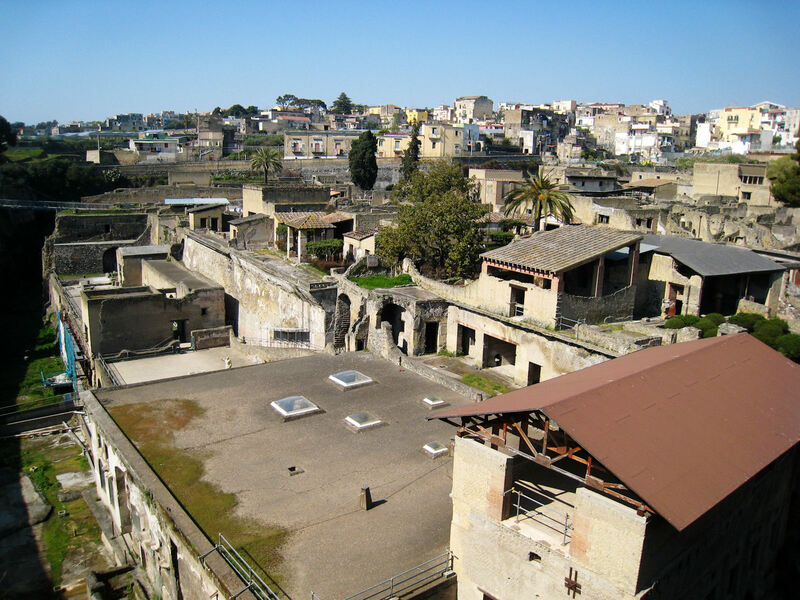 Herculaneum was smaller and its residents thought to be wealthier. After they were sealed so deeply by the volcanic eruption, the names and locations of both these cities were eventually forgotten and remained so for more than 1600 years. Herculaneum lay hidden until the early 1700s when workers digging a well accidentally discovered it. Excavation efforts began in Herculaneum, and a search began for the ancient city of Pompeii as well, where excavations were begun in 1748. By the end of the century, tourists were visiting the ruins of both cities. Archaeological work and tourism have continued to compete for access to the ruins for 250 years. Archaeologists have identified many structures in the two towns. One type that we found quite interesting was the thermopolium, a type of restaurant or snack bar. Widespread in both cities, 89 examples have been discovered in Pompeii. Romans of this period customarily ate lunch away from home, and as a result restaurants of this kind this sprang up in the city. 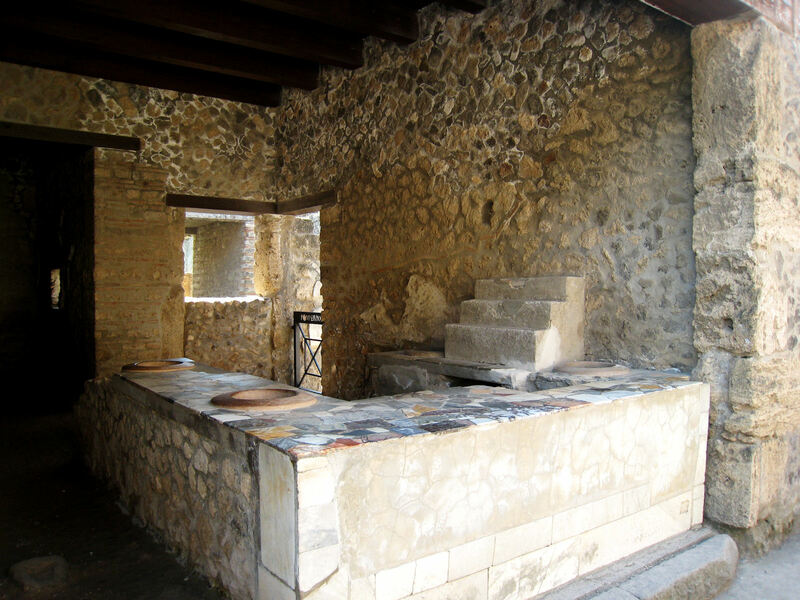 The thermopolium consisted of an open space on the road with a stone bench containing terracotta pots where food was stored. Public customers used this area as a dining room where food was served. There was also a private section for use by friends and family. A late 19th century director of the Pompeii digs introduced a plaster cast method for preservation of human evidence. Liquid plaster was poured into the cavity left in a bed of ashes by the gradual decomposition of a victim's body. As the plaster solidified, it reproduced the shape of the body. 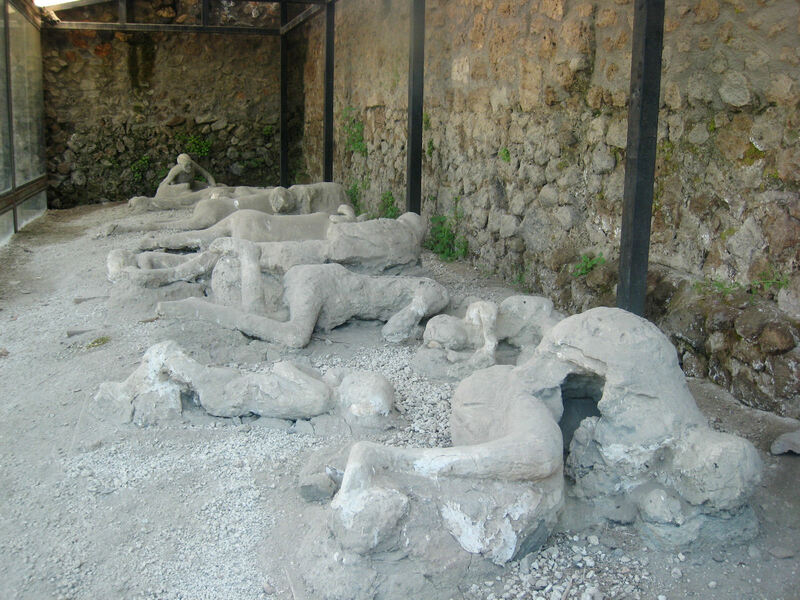 The Garden of the Fugitives was created in a vineyard area of the Pompeii ruins to commemorate the victims of the eruption. A few of the plaster casts are exhibited here. Today the modern city of Pompei (note different spelling) has grown up around the ruins of its destroyed ancestor. 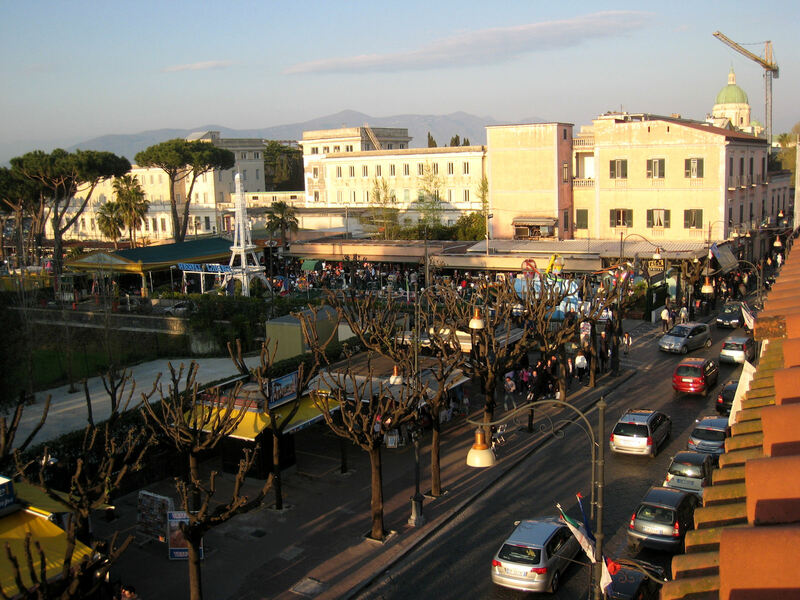 Founded in late 1800s, the city exists primarily to serve the needs of tourists visiting the ruins. Its population today is similar to that of its ancient counterpart at the time of the eruption. Herculaneum, too has a modern equivalent. Ercolano, known as Resina until the 1960s, was built on the site of the ancient city. 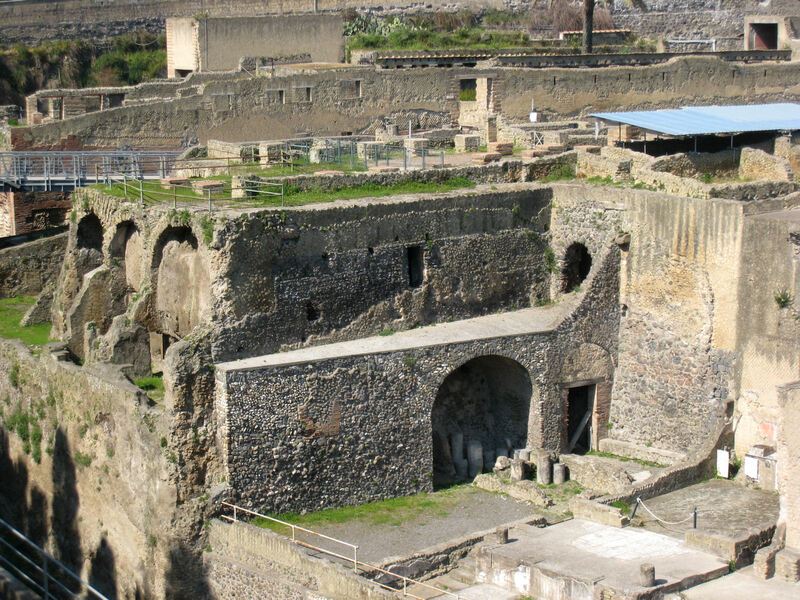 Much of Herculaneum, in fact, has not been excavated because it lies under the current city. Sealed in a time capsule for more than 16 centuries, the ruins of Pompeii and Herculaneum provide primary evidence of how life was lived in these ancient Roman cities. Though much has been learned, many secrets remain to be revealed.